With the Indian Premier League in season, most major brands have come up with innovative campaigns around it. 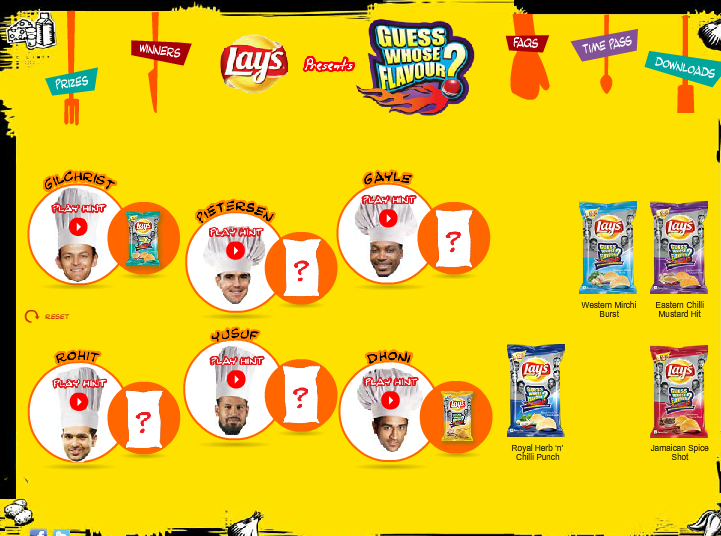 The chips giant from Pepsico inc., Lay’s had started the ‘Guess whose Flavour’ campaign in the beginning of April, where six new flavours were introduced. The contest roped in MS Dhoni, Rohit Sharma, Yusuf Pathan, Christopher Gayle, Adam Gilchrist and Kevin Pietersen, as the six cricketers who have co-created a flavor each and you have to guess which cricketer has created which new flavour. 10 lucky guessers can win a trip with a friend to the ICC World Twenty20 Sri Lanka 2012 and enjoy the match from the premier stand plus a luxurious hotel stay. Besides this, there are 100 daily prizes as Sony PSP’s to be won too! The contest has a dedicated website, a Facebook app as well as a wapsite. You can visit the website, fill up an entry form and then match the cricketers with the flavours before clicking on submit. You can participate through the Facebook app too, provided you ‘like’ the page and fill in the entry form too. In addition, if you have a smartphone with a bar code reader, then you scan the QR code on the back of the Lays pack and then follow the same steps. The design layout is a common one for all of them. I am not much of a follower of the Twenty20 but a Sony PSP is always welcome. Hence, I clicked ‘like’, filled up the entry form and began to do the guess-work with the help of the given hints. After I clicked submit, I expected the app to allow me to share this with my friends, but it just said to keep playing and visit as often as I wished. Apart from the guessing the flavour, there are quite a few interesting features in the app. It has ‘Prizes’, ‘Winners’, ‘FAQs’, ‘Timpass’ and ‘Downloads’ displayed at the top. The former two are self-explanatory and the FAQ is something you should read before you participate. Timepass has games like ‘Lays man’ similar to pacman and Memory magic where you have to find matching ingredients for each of the new flavours. Downloads gives you wallpapers in different resolutions. Is it a good campaign? Well, in my opinion it is! What better way to introduce new products with a simple guessing game, having cricket as the theme in a cricket-frenzy nation where snacking round the corner is also a national timepass. I liked the overall concept, design and execution as well as the fun games in the app. Also, the app follows Facebook guidelines and has all the required information. This is a neat contest for increasing the fan count as well as driving engagement. But what really caught my attention was the use of QR code – cool way to bring in the offline snackers to the online engagement scene. I fail to comprehend why the app does not allow me to invite my friends or share my experience with them. Apart from this, I think there is no need for a login form to be filled every day. Although the FAQ says the contest is on till 30th June and there are 103 Sony playstations to be won every day, the ‘Winners’ section displays the winners until the 1st April only. Wonder what happened to the Randomizer tool after that. Big brands have the capacity for big digital spends and can easily afford such lavish campaigns but it is the local businesses I’m looking out for. 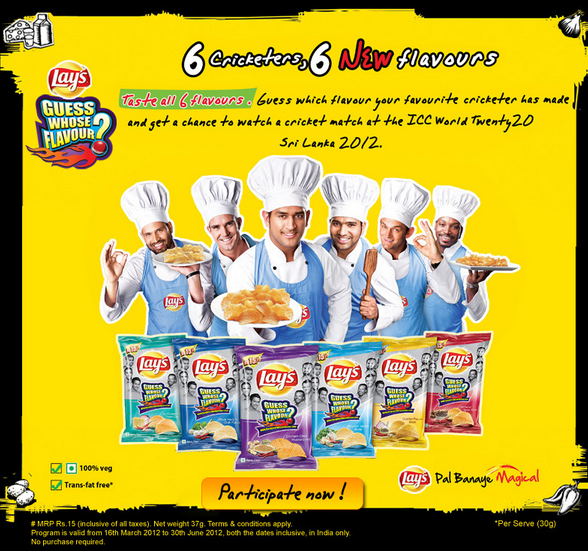 Do let me know your thoughts on the Lays Guess Whose Flavour contest.